In ASP.NET MVC, a user request is routed to the appropriate controller and action method. However, there may be circumstances where you want to execute some logic before or after an action method executes. ASP.NET MVC provides filters for this purpose. ASP.NET MVC Filter is a custom class where you can write custom logic to execute before or after an action method executes. Filters can be applied to an action method or controller in a declarative or programmatic way. Declarative means by applying a filter attribute to an action method or controller class and programmatic means by implementing a corresponding interface. MVC provides different types of filters. The following table list filter types, built-in filters for the type and interface which must be implemented to create a custom filter class. Action filters Performs some operation before and after an action method executes. To understand the filter in detail, let's take an example of built-in Exception filter. An exception filter executes when there is an unhandled exception occurs in your application. HandleErrorAttribute ([HandlerError]) class is a built-in exception filter class in MVC framework. This built-in HandleErrorAttribute class renders Error.cshtml included in the Shared folder by default, when an unhandled exception occurs. The following example demonstrates built-in exception filter HandErrorAttribute. Every attribute class must end with Attribute e.g. HanderErrorAttribute. Attribute must be applied without Attribute suffix inside square brackets [ ] like [HandelError]. In the above example, we have applied [HandleError] attribute to HomeController. So now it will display Error page if any action method of HomeController would throw unhandled exception. Please note that unhandled exception is an exception which is not handled by the try-catch block. Filters applied to the controller will automatically be applicable to all the action methods of a controller. Please make sure that CustomError mode is on in System.web section of web.config, in order for HandleErrorAttribute work properly. Now, if you run the application. You would get following error page because we throw exception in Index action method for the demo purpose. 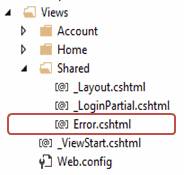 Thus, HandleError attribute will display common error page for any unhandled exception occurred in HomeController. Filters can be applied at three levels. You can apply filters at global level in the Application_Start event of Global.asax.cs file by using default FilterConfig.RegisterGlobalFilters() mehtod. Global filters will be applied to all the controller and action methods of an application. The [HandleError] filter is applied globaly in MVC Application by default in every MVC application created using Visual Studio as shown below. Filters can also be applied to the controller class. So, filters will be applicable to all the action method of Controller class if it is applied to a controller class. You can apply filters to an individual action method also. So, filter will be applicable to that particular action method only. The same way, you can apply multiple built-in or custom filters globally or at controller or action method level for different purpose such as [Authorize],[RequireHttps], [ChildActionOnly],[OutputCache],[HandleError]. As mentioned above, MVC includes different types of filters and multiple filters can be applied to a single controller class or action method. So, filters run in the following order. You can create custom filter attributes by implementing an appropriate filter interface for which you want to create a custom filter and also derive a FilterAttribute class so that you can use that class as an attribute. For example, implement IExceptionFilter and FilterAttribute class to create custom exception filter. In the same way implement an IAuthorizatinFilter interface and FilterAttribute class to create a custom authorization filter. Alternatively, you can also derive a built-in filter class and override an appropriate method to extend the functionality of built-in filters. Let's create custom exception filter to log every unhandled exception by deriving built-in HandleErrorAttribute class and overriding OnException method as shown below. Now, you can apply MyErrorHandler attribute at global level or controller or action method level, the same way we applied the HandleError attribute. MVC Filters are used to execute custom logic before or after executing action method. Filters can be applied globally in FilterConfig class, at controller level or action method level. Custom filter class can be created by implementing FilterAttribute class and corresponding interface.